On April 2, 1978, there was a loud explosion on Bell Island which caused damage to some houses and the electrical house wiring in the surrounding area. Two cup-shaped holes about two feet deep and three feet wide marked the major impact. A number of TV sets in Lance Cove, the surrounding community, also exploded at the time of the blast. It was initially thought to be caused by ball lightning. Meteorologists confirmed that atmospheric conditions at the time were not conducive to lightning. The boom was heard 55 kilometers away in Cape Broyle. The impact occurred in the Bickfordville area, on the southwestern side of the island. According to Tom Bearden, the boom occurred when a bolt of unusually straight lightning impacted the ground at a 45 degree angle (Wikipedia). On April 2, 1978, an anomalous straight, not jagged, beam of "1ightning" came down from the sky at a 45 degree angle to the ground and struck Bell Island, Newfoundland, causing a loud explosion and damage to some houses, etc. Two cup-shaped holes about two feet deep and three feet wide marked the major impact. Wires leading to a shed and coop nearby were vaporized. Both structures suffered considerable damage, but no burning occurred except for a slightly scorched spruce tree. The anomalous bolt did not discharge into prominent metal contact points, such as a metal chimney running down to an iron stove. Instead, all the wiring on the property was blown out. A number of TV sets in Lance Cove, the surrounding community, also exploded at the time of the blast. Weather men confirmed that atmospheric conditions at the time were not conductive to lightning. The blast was heard 45 kilometers away in Cape Broyle. Apparently U.S. Vela satellites picked up the event. The incident was investigated promptly by two representatives from a U.S. weapons laboratory at Los Alamos, according to the news media. (Historical Background of Scalar EM Weapons). The Bell Island Explosion 1978 - EMP weapons? In the 1930s, Tesla revived the idea of tele-geodynamics to create small, realtively harmless temblors to relieve stress, rather than having to wait in fear for nature to take it's course. Perhaps this idea did not remain the idle speculation of a scientist whose star had never been on the ascendant since the turn of the century, and we occasionally experience the devious machinations of invisible "earthquake merchants" at the behest of the unseen hands who wish to experiment on and control the populace (Nikola Tesla's Earthquake Machine). Nikola Tesla (Serbian: Никола Тесла; 10 July 1856 – 7 January 1943) was an inventor, mechanical engineer, and electrical engineer. He was an important contributor to the birth of commercial electricity, and is best known for his many revolutionary developments in the field of electromagnetism in the late 19th and early 20th centuries. 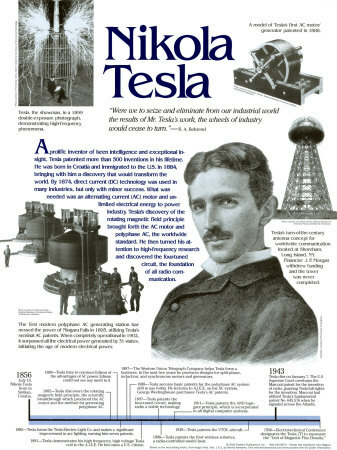 Tesla's patents and theoretical work formed the basis of modern alternating current (AC) electric power systems, including the polyphase system of electrical distribution and the AC motor. This work helped usher in the Second Industrial Revolution (Wikipedia).